Smoke as a flavour is alluring, hardwired into our DNA, the DNA of homo sapiens since the discovery of fire. It’s why bottom pot is present as a desirable dish in many cultures around the world. From the discovery of fire to the preservation of food, it’s wormed its ways into our palates but for the longest time, I didn’t realise other cultures loved it like we – Nigerians – did. I’m fascinated by the things that connect cooks across borders and oceans wide – the ingredients, techniques that are the same in concept, execution and result across cultures. Bottom pot – kanzo, soccarat, tahdig, kazmag, okoge, from Africa to Asia and everywhere in between. Bottom pot is ALL about the Maillard reaction, named after Louis-Camille Maillard who in 1912 discovered a browning reaction while trying to recreate biological protein synthesis. This reaction, from heat causes browning and flavours on the very edge of caramel and smoke. 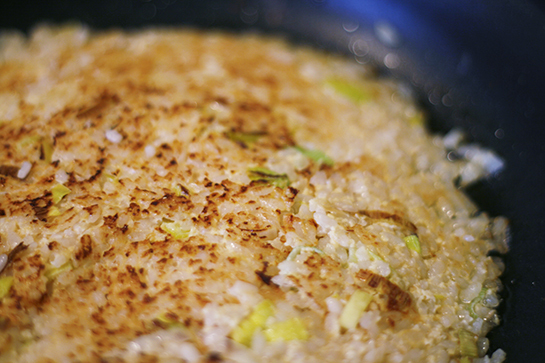 In rice, it creates layers of sweet, smoke and spice. 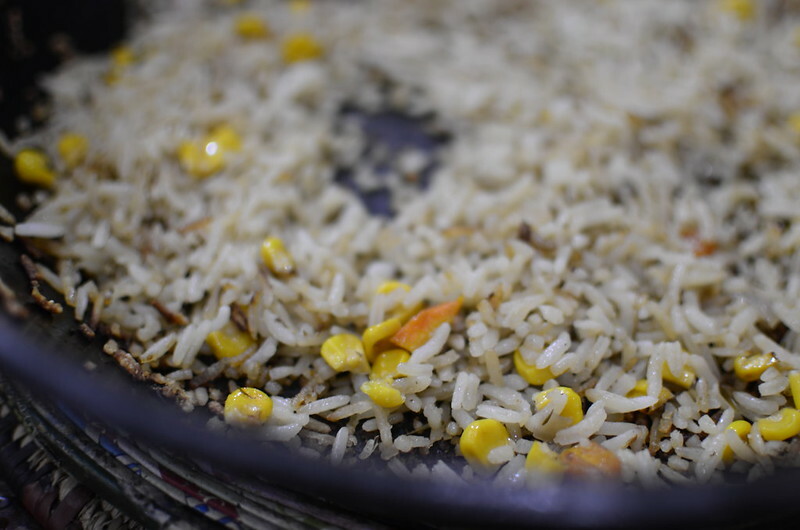 Where there is seasoning, like in Jollof – the seasoning rains down rice in flavour columns that concentrate at the base – commonly forming a mat when unbroken. It’s nutty, caramelized, and crunchy, the joy of savory brittle. Increase the heat at the end of cooking, paying close attention to the sound of the rice (it crackles) and the smell (toasty but not burned). After one or two minutes, check the bottom with a spoon, you should feel a touch of resistance at the bottom of the pan. There – bottom pot! 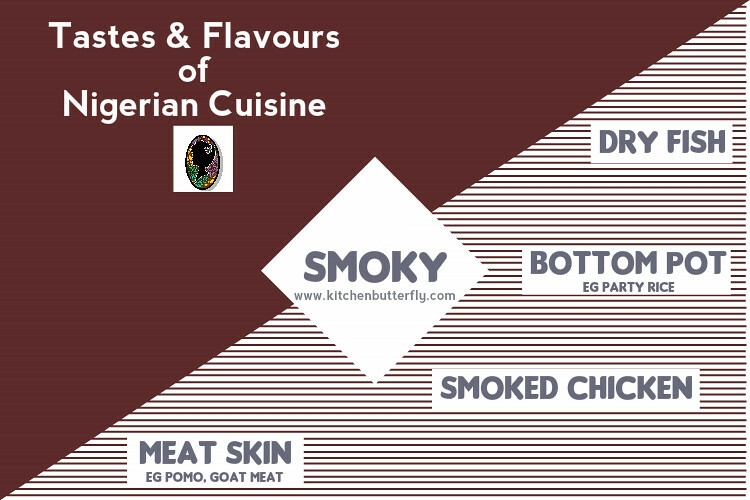 Bottom pot [Nigerian]; Kanzo [Hausa & Ghanaian]; Socarrat [Spanish] is that delightful gift that’s toasted rice grains – smoky, crunchy, full-of-flavour- and sometimes a tad oily. 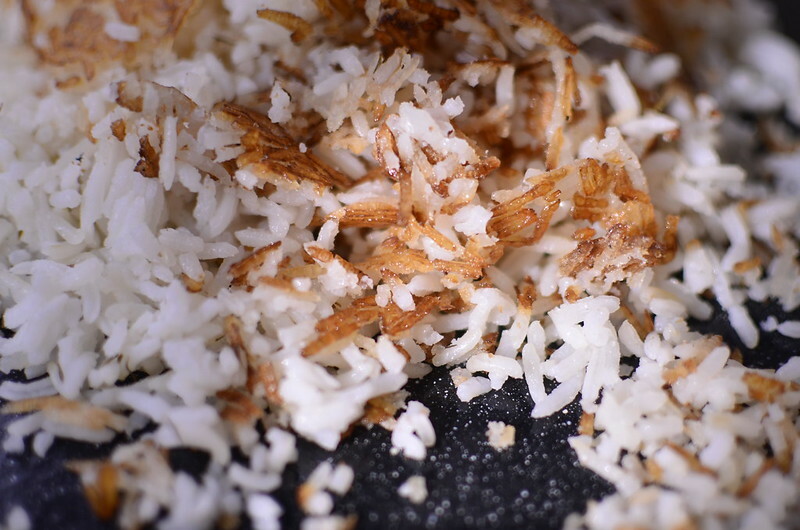 Some don’t tamper with the crust, letting its flavors rise through the rice, while others stir the burnt bits into the rice, creating a wild pattern of rice, black, soft and crunch. Here is a look, around the world of bottom-pot. Originally associated with Jollof Rice cooked over firewood, it has become the defining, much-sought after flavour of what Nigerians call ‘Party Rice’. But this flavour, this smoke can be created on the stovetop too as I would discover a few years ago. The key? Ditch the stainless steel pot and wait till the end, till the rice is cooked…then increase the heat and let it snap, crackle and pop its way to great flavour and if you like, delightfully golden toasted rice. In the north of Nigeria, bottom pot is kanzo [Hausa] meaning “under or bottom”. After making Tuwo, a stiff paste of white medium-shortgrained rice – the bulk of it is removed leaving a mat of mushed rice and the pot is left to cook till kanzo forms. In restaurants/ food places, it is sold as a snack – broken up and eaten with yaji. In Ghana, Kanzo too means the same thing – delicious. There are similarities between Hausa and Ghanian languages, from historic migration. So yes, Kanzo or emo asi which translates to rice-under or rice-bottom mean the same thing. It is also known as “Section B”, meaning to conceal it from others. xoon, a brown crust of rice hand in glove with Senegalese Jollof, Thieboudienne. Lammstagram calls it the chef’s reward…and that sounds just about right. Thieb is a family dish, usually served from one large dish which everyone tucks into. I’ve made it a couple of times and served it in a tray. Typical presentations see Thieb in a large shallow dish, with the fish and vegetables arranged. The xoon, golden and broken decorates the rim as do lime segments for the fish. Made with white or riz gras [meaning fat rice], the Guinean equivalent of Jollof, it is a treasured home dish. My friend says it is popularly served with homemade yogurt but she enjoys it with stews and sauces. Yum. Reminds me a bit of how tahdig, the Persian version is served. So much, so much in common across the world. 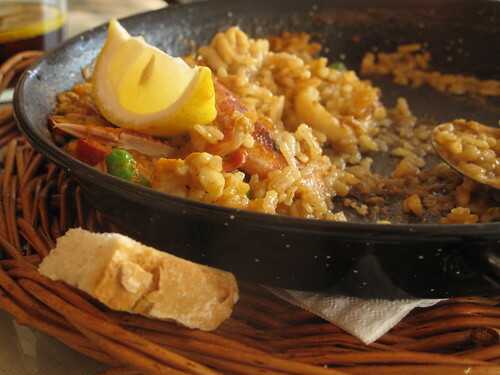 “Socarrat (Catalan) from the Spanish verb socarrar, to singe is the very definition of the perfect paella. It is that golden delicious crust that forms at the bottom of the Paella pan. Shallow, metallic and with sufficient surface area, it allows the development of a flavourful crust but…only when one turns up the heat when the rice is cooked to create this mat. 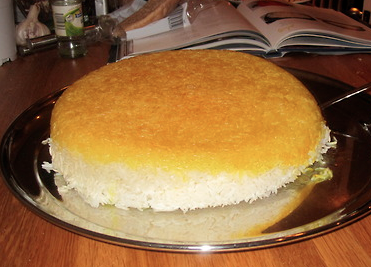 Tahdig, tah “bottom” + dīg “pot” is a specialty of Iranian cuisine, the base of Persian rice. I love everything about it – how it’s made but more deliciously, how it’s served – with saffron and yogurt and all things nice. Sometimes the bottom of the pot is lined with lavash – unleavened bread, other times potatoes, tomatoes and a variety of other vegetables which then create the bottom pot. The rice is turned upside down, onto a platter and diners bread ‘rice’ and dig up pleasures and treasures of everything in the pilaf. It is sometimes studded, served with dried fruits and nuts. Cambodians enjoy bottom pot when it’s cooked in a certain way – with time and care given and good quality rice. When this is accomplished and bay kdaing formed – cooked through and crispy, the top, white rice is removed and set aside, and then the bottom is left to cook a little longer. To finish, a mixture of oil, fish sauce, chopped chives and spring onions is heaped on to it and served. Yum. If I had to offer up a twist, I would add cilantro and crushed chili flakes. Many learn to create bottom pot or Tutong in Filipino by chance – after over cooking or burning one pot of rice too many. 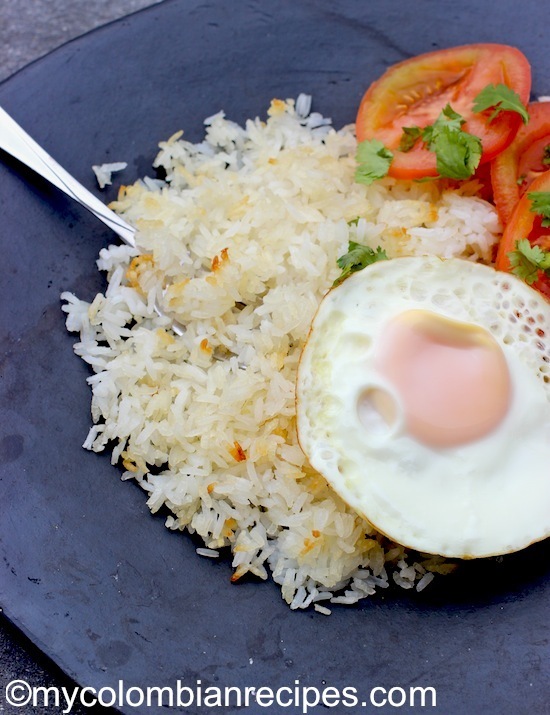 SOme consider this the best part of a rice dish, served with a little sauce, fried eggs and what not. Also known as mi guoba, it means pan adherents. Guo ba is also used as an ingredient in many Chinese dishes with thick sauces, since the bland taste of the scorched rice takes on the flavour of the sauces. Guoba is served in soups and stews and prominently featured in Szechuan cuisine. Since demand for guoba outstrips traditional production and modern ways of cooking rice (in electric rice cookers) do not produce it, guoba has been commercially manufactured since the late 20th century. Often made with glutinous rice, co’m chay is also bottom pot that goes on to become a cracker. It is marshalled into a flat layer which is then cut up and fried in oil till golden. Some meat condiment follows – pork floss or tôm khô (dried shrimp), mỡ hành (chopped scallions cooked by pouring boiling oil over them to release their aroma), and chili paste to produce a popular dish called cơm cháy chà bông or cơm cháy tôm khô (although both the pork and shrimp may be used, in which case the dish is called cơm cháy chà bông tôm khô or cơm cháy tôm khô chà bông). In which I relearn grammar – onomatopoeia meaning the imitation of a sound. Like ticktock of the clock in English and hkaka, of the sound made by metal rice spatulas scrapping the bottom of the pots and bumping into rice. 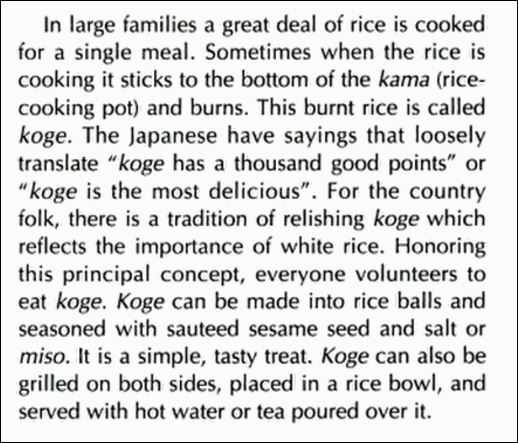 Apparently, the word does not change regardless of your intent with the rice – attaining golden on purpose or just an accident resulting in burnt rice. Both are described in the self same way – Hkaka. Kazmag works as protection – to keep rice from sticking to the bottom of the pot. Cooks in Uzbekistan and Azerbaijan mix oil, rice and eggs together – sometimes yogurt, painting it on the insides of iron pots before preparing plov (similar to pilaf, pulao) – a mixed fried rice sort of dish with meat, vegetables and spices. Once cooked, it is served golden and toasty with the plov. Kazmag can also be made with potatoes. To remove the crust, the pot is put in a large container/ sink with a couple of inches of cold water. After a few minutes, it can be overturned to serve, crust, rice and all. On repeat, repeat, repeat…I know. 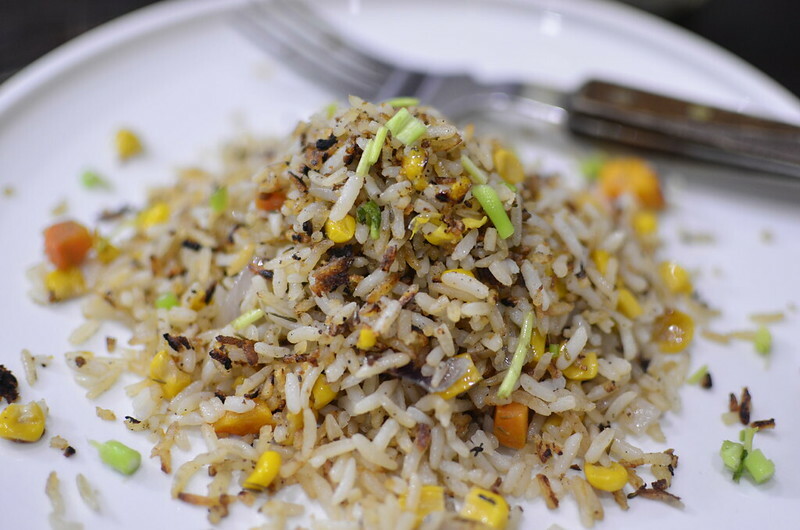 Pegao is the crusty bottom of the pot rice that bears the hallmarks of its compatriots from around the world – crispy and delicious. Also known as Pega, Cucayo, or Chicharras in Colombia, Pegao in Puerto Rico, Concón in the Dominican Republic, Concolón in Panama and Cocolón in Ecuador. Also pega. Both terms come from the Spanish pegado, meaning ‘stuck’ or ‘glued’. In Colombia, the pega is served as a side or for breakfast as leftovers topped with a fried egg; in Puerto Rico, it’s usually served with beans. This dish from Colombia and Ecuador is believed to derive from the Quechua word kukayo, which means rations for traveling long distances. Usually this would involve coca leaf as well as food—both crucial for covering lots of difficult ground on foot. Lovingly served with stewed beef or beans, concon is treasured in the Dominican Republic. Popularly served at the end of a meal as tea, nurungji means “scorched,” in Korean. Made in Korean stone pots, it is the leftovers of rice dishes which continue to cook as the diner eats, losing its soft and white, taking on golden and crisp textures. Once read, it is made into a milky tea by adding hot water, then served. It’s also used to flavor ice cream in Seoul. In Seoul, it is used to make ice cream, served alongside icecream and is also packaged into many sweet, fried forms.